‘At the beginning of 1906 Beatrix Potter was also planning some stories for very young children. Each story contained fourteen pictures and fourteen pages of simple text, mounted on a long strip of linen, and folded concertina-wise into a wallet with a tuck-in flap.’ Only two titles were published in this format. This is a rare example of one of those stories, stunning when unfolded to it's full length of eight feet (2.492 metres), and housed in a custom clamshell case of green morocco over cloth, spine titled in gilt, interior lined with black felt. As a result of the delicateness of this format, they only produced two small print runs, so complete and unrestored copies are scarce. Once upon a time there was a little girl called Lucie, who lived at a farm called Little-town. One of Beatrix Potter’s most successful characters, inspired by her pet hedgehog of the same name, and Kitty MacDonald a Scottish washerwoman. Presented in a pretty, handmade, custom clamshell case by Temple Bookbinders of Oxford. In this sequel to The Tale of Peter Rabbit and The Tale of Benjamin Bunny, Benjamin has grown up and married Peter’s sister Flopsy, and they have three boys and three girls. In March 1909 Beatrix Potter was staying at her uncle and aunt’s house in Gwaynynog, North Wales and so used the gardens there as the setting for this story. 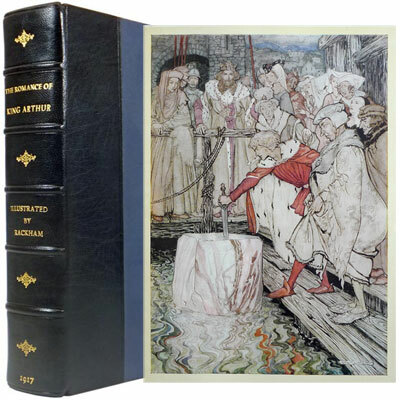 A near fine copy of the first edition. 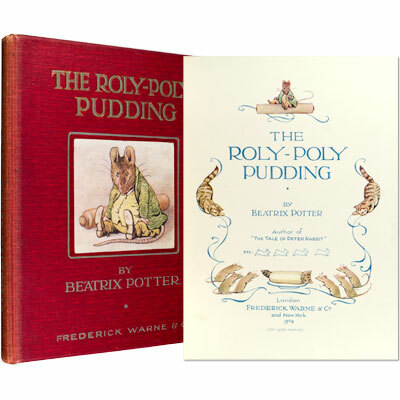 A superb first edition of Roly-Poly Pudding in which Beatrix Potter expresses her love of the quaint old farmhouse at Hill Top, Sawry, which she has taken as the setting for the story, and despite the infestations of rats she had to deal with whilst renovating this farmhouse, she dedicates the book to her former pet - ‘In remembrance of “SAMMY” The intelligent pink-eyed Representative of a Persecuted (but Irrepressible) Race! The illustrations are based upon the actual rooms at Hill Top, which can still be visited today  as Potter arranged for the property to be run by the National Trust and rooms to be kept just as they were during her lifetime. Once upon a time there was a little fat comfortable grey squirrel, called Timmy Tiptoes. Beatrix Potter wrote Timmy Tiptoes in response to the letters she was receiving from American children and librarians, resulting in the appearance of not only grey squirrels but chipmunks and bears as well. A lovely large format edition of these highly readable, magnificently illustrated tales recount the rip-roaring adventures of swashbuckling pirates and buccaneers of the Spanish Main. Includes ‘The Ghost of Captain Brand, Tom Chist and the Treasure Box, Jack Ballister’s Fortunes, The Ruby of Kishmoor’ and other tales. Enhanced by the author’s own incomparable illustrations, including ten full-colour plates, four black and white full page plates, and line drawings throughout. This immensely popular work became a seminal reference for those interested in maritime studies due to the meticulous research Pyle undertook while writing and illustrating the title.